In the manufacture of implants, for example for dental applications, more and more producers have started using the high-performance plastic PEEK (polyetheretherketone). Plasma functionalization of the PEEK implant just before its insertion optimizes conditions for it to bind with organic tissue, thus promoting the healing process. To do this, relyon plasma (formerly Reinhausen plasma) has developed Piezobrush PZ2 a portable and user-friendly plasma device. In orthopedics, especially in the region of the spinal column, PEEK implants have been in regular use for some time. Nowadays, more and more dental implants are also being manufactured from the high-performance plastic. Some of the reasons for this development include PEEK’s mechanical properties, biocompatibility and biostability, the capacity of the polymer to withstand sterilization and its x-ray transparency. For example, PEEK has a lower modulus of elasticity than titanium and a higher one than ceramics. Its values are similar to those of natural bone tissue. This prevents a typical problem from occurring – the stress shielding effect: because titanium and ceramics are so rigid, the implant takes on most of the mechanical load. The bone is therefore subjected to less stress and tends to start degenerating after a while. Another advantage of PEEK is that dental implants can be injection-molded, which significantly reduces manufacturing costs. However, implants made from plastic are still inferior to their metal equivalents when it comes to the healing process in the bone, during which the bone cells grow onto the surface of the implant and bind together. Functionalizing the surface with plasma under atmospheric pressure helps to optimize ingrowth conditions. The effect is based on two proven positive virtues of the plasma: firstly, any microorganisms present on the surface of the implant are destroyed during the plasma process. The germ-reducing effect of the plasma helps decrease the risk of infection. Secondly, the “precision-cleaned” surface increases the body’s tolerance of the foreign implant. This second effect is due to an increase in the surface energy of the plastic – even as far as so-called water wettability. This means that the surface of the implant can be better wetted by substances produced naturally by the body, such as blood and other fluids, which aids and accelerates the healing process. 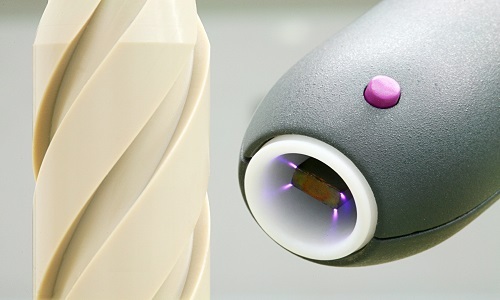 To functionalize the surface of implants with plasma, relyon plasma GmbH (formerly Reinhausen plasma GmbH) developed the wear-free plasma source Piezobrush PZ2. It is integrated into a small, lightweight, portable hand device and works under atmospheric pressure without the need for an external process gas. The plasma is ignited with atmospheric oxygen by a multilayer Piezo element and features a high level of activation efficacy. As the plasma generated is particle-free, the implant can be functionalized directly in the operating room or at the chairside before being inserted. This doesn’t just maximize the positive effects of the plasma process but also minimizes the risk of the implant becoming recontaminated. Implant functionalization takes place at a low temperature of around 45°C. As a result, the plastic is not thermally stressed by the treatment with Piezobrush PZ2 and the dimensions of the implant remain stable. The well-designed lightweight hand-held device makes it easy even for less technically-minded users to use and is safe both for the patient and the user. The low voltage supply of 12 volts is a further safety factor. For processing dental implants, as an alternative to the hand-held device, relyon plasma also supplies an efficient table version, which is equally easy to operate.